Which American city recycles the most? A study of major cities sponsored by Nalgene, a company that makes reusable drinking bottles, gives us some indication. By their measurements, San Francisco recycles more glass, metal, and plastics than anywhere else. Ninety percent of San Franciscans report that they recycle. San Francisco’s commitment to recycling is clearly part of a larger concern for the environment. The Nalgene study named it the most “green” city overall, as well. It’s no surprise that San Francisco gets such high marks for caring for the environment. The city government has launched a “zero waste” initiative that aims to completely eliminate waste by the year 2020. According to the latest statics offered by the city, it already recovers 77% of the materials it discards. It has accomplished this through proactive efforts by the local government: all residents are required to separate recyclable and compostable material from their trash, and building owners and event managers must provide color-coded receptacles for recyclable materials. The city government also promotes awareness in various ways, including a television advertising campaign. In addition, it has worked to ensure that every residence has access to a recycling service. Most cities aren’t as green as San Francisco, but with RecyclerFinder.com, it’s easy and free to find the nearest recycling center, no matter where in America you live. Recyclerfinder.com also offers a mobile app that allows you to keep the nearest facility’s information in your phone through the use of a QR reader. Keeping an Eye on the Planet – Glasses or Contacts? People who require vision correction may not stop and think about the environmental impact of their choices. Some people prefer contact lenses over eyeglasses because they are less bulky. Other people prefer not to hassle with lens cases, soaking solutions and remembering when to replace their disposable contacts. When basing their decision on its impact on the planet, is there a clear choice? Because contacts and eyeglasses are both so small, it is difficult to imagine either having a significant negative effect on the environment. However, the manufacture of poly carbonate, a material often used to make eyeglass lenses, requires the use of toxic chemicals. Contact lenses are sold in blister packs that are also often packaged in cardboard packages. Contact lens users may go through up to 15 12-ounce bottles of solution per year. 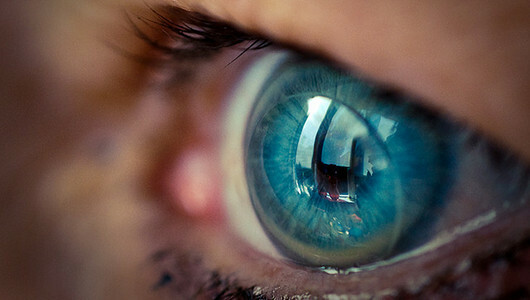 With more than 100 million people in the world using contact lenses, that is a lot of waste. The amount of lens solution required depends on the type of lenses. Daily use contact lens wearers are less likely to go through several bottles of solution per year, but they will discard more packaging than wearers who change their contacts less often. When it comes to glasses, frame-less styles use less raw material. 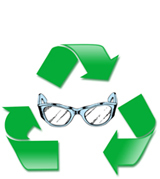 Regardless of the type of lens used, wearers can help save the planet by recycling as much as possible. In many countries, glasses can be recycled through a variety of organizations. Recycling options are also available for the cardboard and plastic packaging that houses contact lenses. Recyclerfinder ( http://www.recyclerfinder.com ) can help lens wearers find local facilities to recycle their eye wear so they can help the environment and produce less waste.